Experience the tastes of the Coorong. Join us for a bold Aussie red or aromatic brew in our Wine Bar/ Cafe. Support local artists at our Live Music Events. 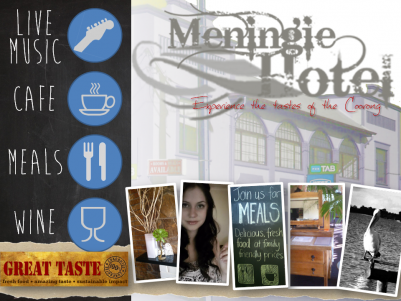 The Meningie Hotel - Open 7 days. 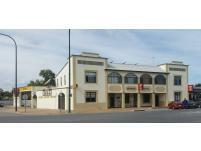 Featuring TAB, Dining, Gaming Room, Drive Thru Bottle Shop, Accommodation and more. We welcome group bookings for business functions (conference facilities available), birthday parties and other special occasions. The hotel also offers affordable accommodation with single, twin & double rooms available, share bathroom. 90 minute Happy Hours: Wed (5-6:30 pm) & Sun (4-5:30).